Setting off 4th due to his finish on SS05, KTM-rider Antoine Meo immediately set about chasing down his team-mate Matthias Walkner and the other riders in front. Slowly building pace as the day went on, the 33-year-old Frenchman made very few mistakes and snatched victory right at the climax of the stage. "This was a good day," said the stagewinner. "I am so happy to take my first win of this year’s event – it feels great. The stage was very long and it was so cold out there. I had a great battle with Toby for the whole stage but as we neared the finish, the last 10km got really muddy and very slippery so I knew I had a chance to make up some good time. I took the risk, pushed on really hard and managed to beat him. Tomorrow we have a rest day, which will be nice and then it’s onto the second half of the rally." 2016 Dakar winner Toby Price challenged for the win throughout the short two-hour timed special. Finally finishing 3rd, Price’s time matched exactly that posted by runner-up Kevin Benavides. With only a split-second separating the two after nearly 200km of riding, the former world enduro champion was happy with his pace but disappointed to miss out on the win. "Stage six worked out really well," Toby Price reported. "We had a long morning with the extended liaison section and that was really cold to ride. The special went well, but we caught some rain from about the halfway point and it made things very slippery in places. I got 3rd, which I’m happy with but I need to try and get back some time on the top guys." Matthias Walkner, by being one of the first to start, was at a slight disadvantage as is often the case in rallying. Walkner rode a good day without mistakes, and although placing eighth at the end of the stage the Austrian was pleased with his pace and will go into the second week of racing holding third in the overall standings. "This was a long day, but I enjoyed the stage, I love riding into Bolivia, the people here are wonderful," said the Austrian. "Everything is going to plan and I’m in a good position going into the second week of racing. I feel I need this rest day because the first week has been the toughest I’ve ever known at the Dakar and my whole body is aching. I think the next marathon stages will really sort out the positions at the top of the standings. Bolivia has always been tricky to ride and with the weather being so bad it will be even more difficult." 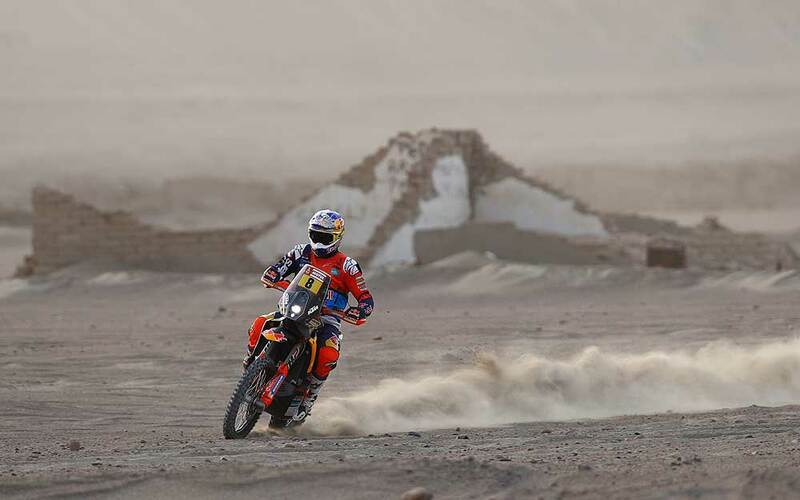 Spanish Rallylady Laia Sanz continues to impress on this 40th edition of the Dakar Rally. Utilising her excellent enduro skills in the wet conditions, Laia again put in a performance that placed her well within the top 20. "It was a good day, but so cold out there. The liaison section was very long and it was freezing when you were riding. The special was ok because it was very fast and I think my pace was good, despite not wanting to take any risks." 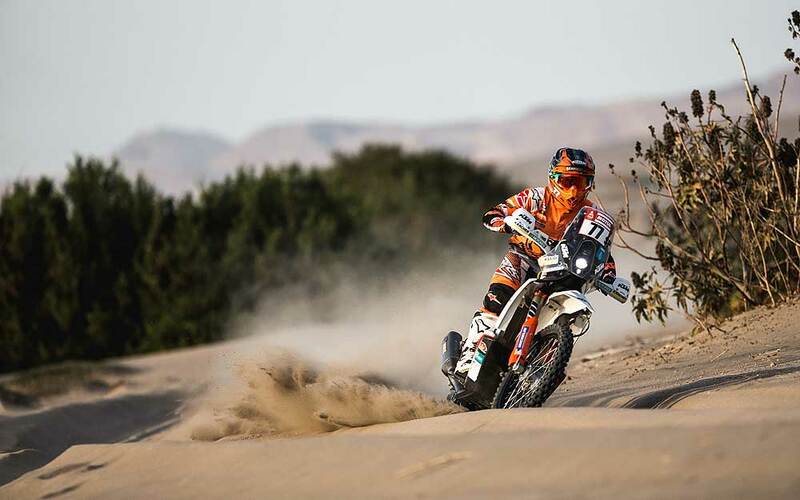 KTM Factory Racing’s Luciano Benavides reached the end of the stage in 26th place. The Argentinian suffered a fall on the first few kilometers of the timed special but was able to re-mount and continue by following a passing rider. Benavides’ 17th place in the overall standings still places him as the fastest rookie at this year’s event so far. "It was a really tough day, Benavides said. "Unfortunately, I had a crash right at the beginning of the stage and broke both my road book and GPS. I was forced to follow someone and just tried to stay consistent and not make any more mistakes. I lost some time over the course of the stage, but I’m happy to get back in one piece."